The impact of more visible standard drink labelling on youth alcohol consumption: Helping young people drink (ir)responsibly? Jones, S. C. & Gregory, P. (2009). 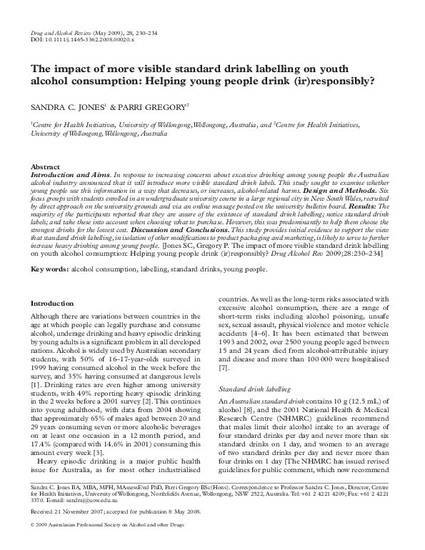 The impact of more visible standard drink labelling on youth alcohol consumption: Helping young people drink (ir)responsibly?. Drug and Alcohol Review, 28 (3), 230-234. Introduction and Aims. In response to increasing concerns about excessive drinking among young people the Australian alcohol industry announced that it will introduce more visible standard drink labels. This study sought to examine whether young people use this information in a way that decreases, or increases, alcohol-related harms. Design and Methods. Six focus groups with students enrolled in an undergraduate university course in a large regional city in New South Wales, recruited by direct approach on the university grounds and via an online message posted on the university bulletin board. Results: The majority of the participants reported that they are aware of the existence of standard drink labelling; notice standard drink labels; and take these into account when choosing what to purchase.However, this was predominantly to help them choose the strongest drinks for the lowest cost. Discussion and Conclusions. This study provides initial evidence to support the view that standard drink labelling, in isolation of other modifications to product packaging and marketing, is likely to serve to further increase heavy drinking among young people.